This FLEXSTATION unit consists of freestanding components that meet the varying needs of the evolving work environment. Purchase basic components now and add compatible pieces in the future, without disrupting the office layout. Innovative accessories enhance FLEXSTATION's effectiveness in the office environment. 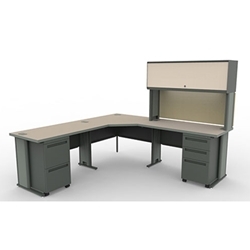 Unit includes: overhead, tackboard, task light, pedestals and keyboard tray. Our Installation Department will coordinate your delivery to assure a prompt set-up.